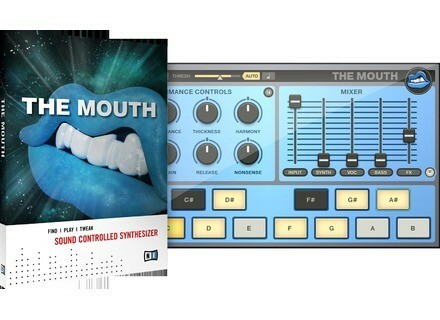 The Mouth, Effect sequencer from Native Instruments. 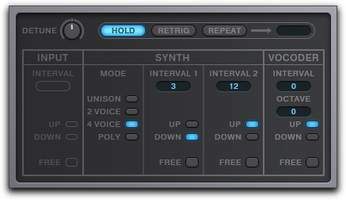 The Mouth, second effect created by Tim Exile after The Finger, allows you to process any input signal in a creative way, even though it shows some preference for vocals. Is it a vocoder? More? Or less? The following example includes several selections: the first one is the original vocal recording and the last one a mix of four. As you can hear, the detection algorithm is quite powerful and you can get very versatile results using only one of the sound modes. On the quite complex file below, The Mouth does a very good job and has no problems shifting the pitch according to the chord played with the keyboard. Below some sound samples using only the Synth section with our vocal signal. As for the Vocoder, the Spectral Amt control allows you to progressively switch from a classic vocoder to a resonator, while Sensitivity acts on the filter bands and Noise and Resonance adjust the respective volume. 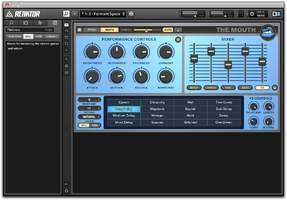 The Vocoder section has 16 presets. In the Harmony section, you can control the interval and octave parameters with the three usual options (Up, Down, Free). For the next sound sample series we used our original file again. Let's turn now to the Bass section, the software's "poor cousin." 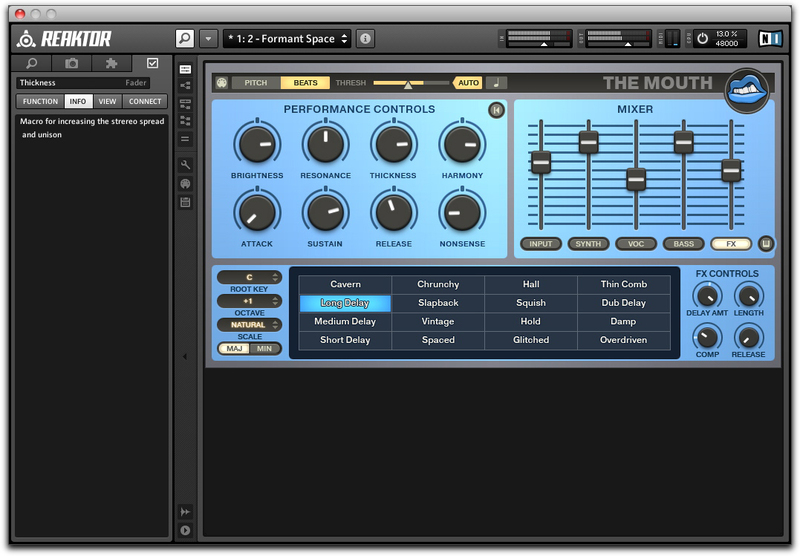 Here we have only four presets, the possibility of a second voice (Double), upper-harmonics volume control, and Center and Range controls, which allow you to change the pitch of the sound generated. This section is like a suboscillator rather than a real bass synth (compared with The Mouth's Synth section). Finally, the FX section includes a delay with adjustable rate and time, and a compressor with adjustable rate and release, and once again 16 presets. You can listen to them in the following sound samples. Now, let's listen to the software with all sections activated. Firstly, on vocals, including several doubled voices. Now, let's try it on rhythm loops: for the first example we did some hand clapping and chest beating, the second one is a real drum groove. Here is how it sounds playing notes on a MIDI keyboard. 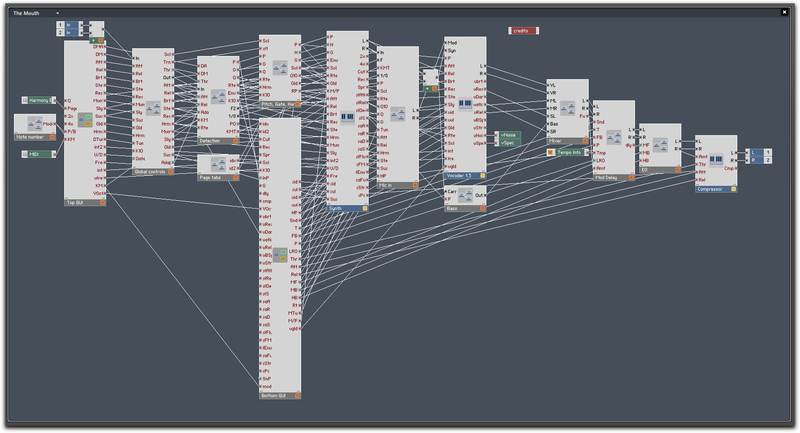 And now modifying the Performance controls in real time with the MIDI Learn function available in almost every stage. You can also use it to make totally different things. Without changing the vocoder concept, but mixing different principles and responding to everything that its conception implies, The Mouth is a very nice surprise. It works like a charm, has a powerful detection algorithm and some nice additional features — a successful concept all around. The sound is always interesting and the number of presets provided is a very good starting point for beginners. You can edit them as you wish, but you'll have much more fun creating some new ones. We only regret that it has some limitations due to design and ease of use: for example the lack of an independent filter or a real envelope in each section implies that all Performance controls act always on all modules. 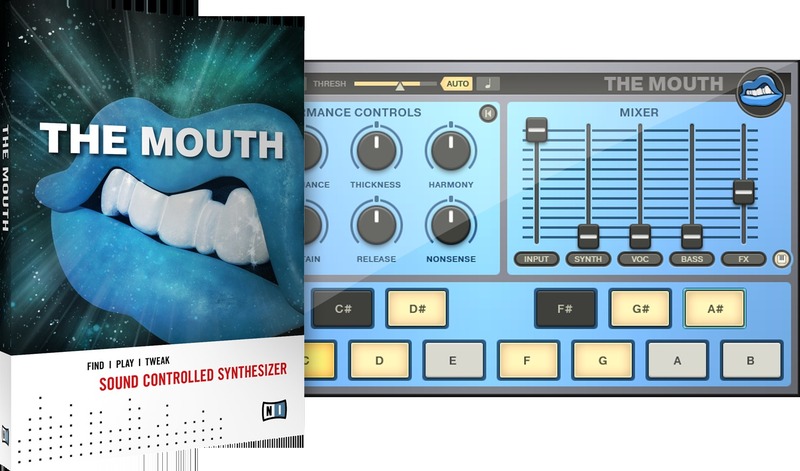 But considering the price, the overall sound quality and the ability to use the free Reaktor player, The Mouth can be a very good choice if you want an editing tool for vocals and loops (even if you can find much more powerful tools for loop editing). On the Native Instruments website, several video clips show Exile using the software in an IDM context, which is a good way to discover possibilities we cannot describe in this article.